Some of the Bijuu have elements that are not one of the five common natures. If you become the jinchurriki one of these bijuu, you gain access to their unique chakra natures. Side effect: This Tailed beast can take over the Jinchuriki when ever they sleep. requirements of each. If one gains Beast control, they then become able to spawn individual parts of the beast as necessary. Description: This is just where you learn to draw on the beast's chakra like Naruto did in Part 1 of the series against Gaara. Description: At this stage you and your Beast learn to mold your chakras in perfect harmony like Killer Bee and the 8 tails. At this level you can also use the Host Transformation to transform into your tailed beasts true form. The One Tails does not abide by the rules above. Since the Shukaku does not have a chakra form it only has the beast form, which means it can transform from the sand. It gains +100 to each stat when it transforms. The Bijuu you obtain adds to your Jutsu damage specialty. The natures they have give you a bonus of 150- 300 dmg towards that type of jutsu. The Ten Tails' full-matured form. Must Battle each Jinchuriki to the death to and seal their Bijuu. Then preform a Jutsu to combine them all together (200 SC). Once the Ten Tails appears, you must seal it in yourself after battling it (300CS), then Start your jincuriki control requirements. Failure in any of these steps will result in annihilation and the ten tails running wild and destroying everything in its path. Description: By manipulating the natural world in its vicinity on an enormous scale, the Ten-Tails is able to simultaneously create a variety of natural disasters that devastate the surrounding area, with itself acting as their epicentre. The phenomena involved in this technique include: earthquakes, thunderstorms, and tornadoes. Ability: Destroys/levels landscapes to leave nothing but destruction in its path. As the title of this says, this will tell you how the jinchurriki will operate. Shukaku/One Tails: This jinchurriki will have the ability to manipulate sand, this sand can be used as both offence and defense, though this tailed beast is very cruel, and often tries to take the host over. The host can form the Shukaku out of the sand they use, however there is no chakra form available for this jinchurriki. Matatabi/Two Tails: This jinchurriki has access to two different forms, these forms being initial chakra form, where the user gets a chakra shroud with either one or two tails, depending on their need. The second form is the full beast form, in this case, the ethereal chakra cat known as Matatabi. Isobu/Three Tails: Much like the two tails, this jinchurriki will have access to two different forms, the charka shroud, (1-3 tails) and the full tailed beast form. Son Goku/Four Tails: This is where they start getting fun, the four tails jinchurriki has 3 forms they can access. First, the initial chakra shroud, (1-4 tails) Second form chakra shroud, (4 tails), and then the full tailed beast form. Kokuo/Five Tails: Same as the four tailed jinchurriki, adding in the fifth tail. Saiken/Six Tails: Same as the five tailed jinchurriki, with six tail added. This jinchurriki also gains access to bubble ninjutsu, much like that of Utakata. Chomei/Seven Tails: Same as the six tailed jinchurriki. Gyuki/Eight Tails: same as the seven tailed. Kurama/Nine Tails: This jinchurriki has the most forms to access out of all of them. They have the initial tailed beast chakra shroud the chakra shroud state 2, the full Kyubi chakra mode, and last but not least, the full nine tails form. The forms also vary with how Kurama reacts to the player. EDIT!!! 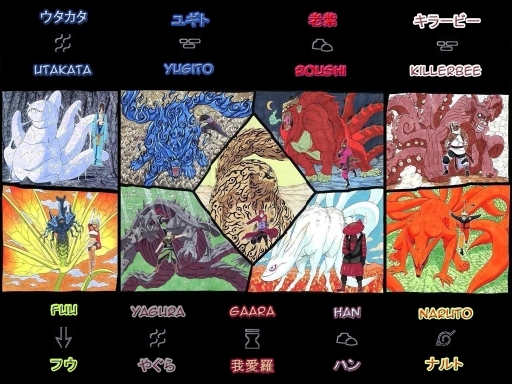 All tailed beasts, (excluding the shukaku) have access to the "Version 2" Chakra form. In light of this happening in the manga, it shall be allowed in here. Also, all jinchurriki who have mastered their bijuu can manifest parts of the beast as needed. Like Killer Bee being able make whatever body part he needs appear. Description: A tailed beast uses its massive chakra reserve to turn anything from a roar or a wave into a powerful force of pressure and destruction. When Naruto Uzumaki was in control while using the Nine-Tails' power, he demonstrated powerful shockwaves by roaring or movement of his arms. When enraged or when the Nine-Tails took control of his body, he has been shown to use explosions with powerful wave of his arms. The raw force behind Naruto once he enters Version 2 was powerful enough to force Pain's Shinra Tensei back at him. When used by Kurama itself, it's powerful enough to completely disperse powerful attacks like the Sage Art: Ultra-Big Ball Rasengan, and even knock back fully transformed tailed beasts. Ability: Sends objects or opponents flying back from user. Description: The Tailed Beast Ball is the ultimate technique of a tailed beast. To form the attack, they gather both positive black chakra, and negative white chakra, shape it into a sphere, and then compress it inside their mouth. The black and white chakra needs to be balanced at an 8:2 ratio respectively or it will backfire. The ball can be fired differently, either in sphere form, which can be detonated for a wave explosion or launched to form a dome-shaped blast which flattens and erases everything around it, or as a concentrated beam of energy which gives it explosive penetrative power. A Tailed Beast Ball is incredibly dense, as when Naruto Uzumaki in his four-tailed form created one, ground around him sunk beneath his weight after he swallowed it. When used in close proximity to other tailed beasts performing the technique, the Tailed Beast Balls can be combined, vastly increasing the attack's destructive power and size. The power of the attack is relative to the power of the user. The technique fired from a four-tailed Naruto broke through three Rashōmon gates without losing its momentum. A fully charged Tailed Beast Ball from Gyūki can fill an entire valley with the explosion as well as plough through a multiple layered barrier, while Kurama's own can create an explosion that is far larger than the Hokage Monument and the mountains around it, as well as equal that of a combined ball of five tailed beasts. Individual Tailed Beast Balls from Matatabi, Isobu, Kokuō, Saiken, and Chōmei seem to be on the same level of destructive power since they all easily vaporised large mountains after Naruto deflected them with his speed. When used by the Ten-Tails in its mature form, the Ten-Tails' Tailed Beast Ball took on a conical shape, and upon impact was able to destroy an entire village some distance away. The tailed beasts' jinchūriki can also use this ability, though they need to be in their full tailed beast forms. Should the jinchūriki lose control of their tailed beasts, they can perform this technique despite not being fully transformed, as seen when Naruto used it in his 'Version 2' form. Description: This is an ability a jinchūriki is able to perform when in a tailed form. The jinchūriki will use the raw chakra of the their Tailed Beast to form arms, which they can freely manipulate to attack their foes, able to strike an opponent faster than even a Sharingan user can react to. The chakra arms hands are clawed while the rest of the arm seems to lack any kind of joint, thus allowing them to have flexible movements that will generally be impossible for normal arms. 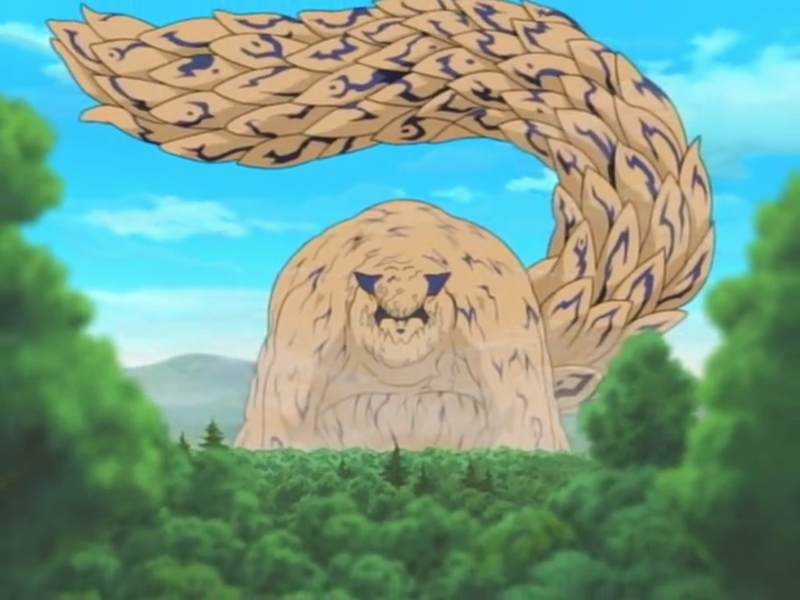 The user can create any number of arms that they desire and they can also serve other purposes such as grappling hooks, to either grab onto objects or enemies from great distances, for offensive means, as merely touching one of these can cause fatal burns, due to the Nine-Tails' seething hatred within its chakra (though this is not always the case). Due to having chakra attached to his body, the chakra arms can grow in size and from the fourth tail up, Naruto, the arms, or any part of his body can divide into two or more fully operational appendages. Killer B has also been shown to use this technique though instead of arms, he can form horns which he uses for his Lariat technique. In his Nine-Tails Chakra Mode, Naruto can use the chakra arms to a greater extent, as he can use and release chakra arms from anywhere on his body on a small or large scale. These arms even have the power to crush stone without Naruto putting much thought into it. After some practice, he mastered the chakra arms, able to manipulate various stones and geometric shapes without crushing them. Now he is able to use them in an attempt to create a new technique: the Tailed Beast Rasengan since he was advised by the Eight-Tails against the use of shadow clones in this form. Naruto's mastery of the Tailed Beast Chakra Arms is so great that he is able to create several at once to launch attacks at several enemies, use them to pull enemies into the attack, and even create tiny ones around his finger. The arms also grant him a greater level of dexterity and manoeuvrability out of what would normally be a helpless situation, such as guiding his Rasenshuriken during his fight against the Third Raikage. Ability: Explained above in good detail. Description: An innate skill possessed by all tailed beast, which allows them to communicate with one another mentally. Using this telepathy, the tailed beast can create a dimension within the subconscious of their jinchūriki where they can communicate without outside influences. There are apparently two levels of this subconscious and according to Kurama, once a jinchūriki is further linked with their tailed beast, they will be able to enter this deeper level of their subconscious. This secondary level is not penetrable by others, even if the beasts are being controlled. Ability: once the user and tailed beast are linked they can use this. Description: This air defence technique creates a giant shield of sand that is suspended in mid-air by raising a great amount of sand from the ground. By gathering the best possible mineral-rich sand, the hardness of the shield is considered to be very high. Furthermore, the sand has its defensive strength raised by flowing chakra through it. It was strong enough to protect Sunagakure from Deidara's C3. Ability: Can defend large amount of allies from attacks. Description: Using this technique, Gaara can cover himself in a compacted layer of sand, providing an additional defence should his Shield of Sand fail; combined, these two are known as Gaara's "Absolute Defence". Though quite effective, maintaining the armour requires a large amount of chakra and stamina. Furthermore, it is nowhere as resilient as the Shield of Sand, since it easily breaks away upon impact, indicating that the sole purpose of the armour is to absorb impact channelled unto Gaara's body during battle. Another weakness is the additional weight of the sand which leads to decreased levels of speed and mobility. Ability: Allows user to let the sand absorb most of the damage for half. Cost: 50 stamina per post active. Description: Using a large quantity of sand, Gaara covers the enemy with several successive layers of the material, before compressing it into the form of a huge pyramid which acts to imprison the target upon its completion. Description:This is one of the multiple offensive and auxiliary methods Gaara has thought of during combat. It is a trick where he uses the chakra-enhanced sand to support his own weight and float in mid-air and to use as a method of transportation if needed. By increasing the size of the platform Gaara can transport others along with him. Ability: grants the user the ability to fly on a platform of sand. Description: Gaara using his ability to manipulate sand, loosens the ground below his enemy and catches them in a maelstrom of sand. The swallowed enemy sinks up to two hundred metres underground, while completely unable to move a muscle. Then, the sand glued onto their limbs applies pressure on their whole body, so they can't even twitch a finger. The pressure resulting from being buried at such an extreme depth would surely kill any normal human, if not from suffocation, then from the fact that all their bones would break. Description: With his ability to control sand, Gaara encases his opponents in a large amount of the special chakra-infused sand kept inside his gourd, immobilising them. It can be used to suffocate an opponent or in preparation for a deadlier technique, the Sand Waterfall Funeral. This appears to be Gaara's signature technique. Description: After wrapping an opponent with sand with either Sand Binding Coffin or Sand Drizzle, Gaara will cause the sand to implode and crush whatever is within it. According to Gaara, when used to kill a person, the death is so quick that there isn't even time for the victim to feel any pain. The pressure also produces a sizeable fountain of blood. Gaara can control the pressure used in the attack, which allows him to either break bones or completely liquefy an opponent. Description: Gaara forms a small sphere made of sand and compresses it to increase its hardness. The sphere can strike opponents with such speed and force that it knocks them unconscious. He can also change its trajectory, to strike down multiple targets. By using this one small bullet, Gaara was able to defeat the Suna Assassin Captain along with all his subordinates. Description: After clotting together sand into countless small lumps, Gaara uses them to attack an enemy from every direction. Because all the sand lumps are controlled by chakra, it is possible to commence an attack without any blind spots. This technique is often used as lure in battle, distracting an opponent and leaving them vulnerable to an attack from below. In order for this to work, the enemy is first made to face upwards with the sand rain, simultaneously bringing their field of activities under the user's control. Then, a bold move is made from underfoot. To make sure the rain hits its mark, it can be combined with Sand Binding Coffin to immobilise the target. Description: A larger scale version of the Sand Drizzle, Gaara gathers his sand into large clumps in the shape of massive boulder-like formations and then drops them from the sky on to his opponents. It covers a large range, making it difficult to dodge. Like the Sand Drizzle, the technique can distract the enemy with the aerial assault, leaving them open to an attack from below. Description: Sand Sensing is a contact type sensory-technique. By dispersing specialised sand into a specific area, the user is able to discern the presence of bodies that comes into direct contact with it. This sensing sand can be spread across a wide terrain, or even float in the air allowing aerial foes to be detected. Once the sand comes in contact with a person, it will wrap itself around them, rendering even invisible targets, visible. Ability: Allows user to sense enemies in areas around them who are invisible. Description: A technique that is unique to Gaara. Whenever Gaara is about to be harmed, a shield of sand will automatically surround and protect him. The sand will react regardless of Gaara's will, even protecting him from self-inflicted injuries. Ability: Forms absolute defense however can be broken with enough force. Cost: 100 stamina per post in use. Description: A more powerful version of Gaara's Sand Drizzle. Gaara creates dozens of sand bullets that he uses to attack the enemy. Description: The Spear of Shukaku is the attack counterpart of the Shield of Shukaku. Like the shield, Gaara crushes the hardest materials from the ground using sand, this time in the form of a halberd, in the shape of the Shukaku's hand. Just like the shield which has yet to find anything that could break its defence, the halberd has yet to find a defence that it can't break through. Description: This defensive technique is used by Gaara to create a toy-like replica of Shukaku wearing a wide-brimmed rural hat, that is roughly thrice the size of Gaara. Because the replica is formed under extreme pressure and is built of the strongest minerals which Gaara could derive from the earth, it is virtually indestructible, having yet to be penetrated by any force. As the name implies, this is Gaara's strongest defence. Ability: can defend against frontal attacks. Cost: 200 stamina per post in use. Description: A technique used by Gaara in his miniature Shukaku form. He shapes the sand composing his arms into countless shuriken, and he swings them both. Taking advantage of that formidable centrifugal force, the fired blades of sand change into dangerous weapons. Gaara creates and fires an uninterrupted succession of sand rounds, tearing everything in sight to pieces. Description: To use this technique, Shukaku will first take a deep breath, and then pound its stomach to apply external pressure, the power of which it uses to shoot a highly compressed air ball from its mouth. The expelled air ball is mighty enough to hollow out the ground, and level an entire forest. Because of the large quantity of chakra kneaded into it, it explodes the moment it reaches its target, dealing an enormous amount of damage, as well as levelling anything in its path. Shukaku is able to fire multiple of these in rapid succession, having a certain level of control regarding the size of the bullets. Description: The user grows one of Matatabi's tails and scatters three fire rats which explode if approached. Description: The user spits out a flaming ball of hair that assumes the shape of a mouse engulfed in flames, which then continually splits in to individual and similarly ablaze hairs. These flaming projectiles pursue the intended targets before exploding, once they come into contact with an object. Description: While in her transformed state, the user slashes the opponent with a powerful and quick swipe, using the extended nails on their hands. Description: While in full Two-Tails form, the user fires a huge spectral fireball made of chakra and fire that explodes on contact. These blasts are very destructive, and can reduce her surroundings to rubble. Innate ability: The user can form Coral whenever the user wishes to make their attacks even more deadlier than what they would be normally. Description: The user creates a large, flat, circular pool of water in front of their opponent. Its surface acts like a mirror, perfectly reflecting the attacking targets. By then hooking onto and rotating the 'mirror' 90° with their staff, the reflections emerge and materialise from the mirror, where they collide with the mirrored targets. As these reflections use the exact same technique as their counterpart — regardless of its type — they counter the attack completely, while repelling them in the process. However, upon impact, the reflections disperse into water. Ability: Reflects opponents attacks back at them. Description: While in his transformed state, Yagura strikes the opponent with a powerful blow, causing a large formation of coral to quickly grow from the initial point of contact. This then rapidly solidifies and restricts the enemy's mobility, as the substance continues to grow, eventually covering their entire body. Description: The Three-Tails releases a mist created by its chakra to put intruders under an illusion. The illusion torments the target with events from their past. The illusion will vanish if the victim can break the illusion, either by themselves or with the assistance of another. Ability: Torture the opponent with past events. Locks them in place for 3 posts. Description: Isobu (or Yagura while fully transformed into Isobu) can roll into a ball and bulldoze its opponents, making full use of its many spiky protrusions in a manner similar to the Akimichi clan's Spiked Human Bullet Tank. This manoeuvre can also be used to escape attacks. Description: The Three-Tails gathers raw chakra, along with water, into a single compressed sphere before firing it at its target. The Three-Tails has shown the ability to create two water-balls at the same time. Description: The user first fills the area with water then knocks the enemy underwater, before transforming into Isobu. He then grabs the enemy and thrusts them out of the water, spitting a stream of water directly at his opponent. Innate Ability: The user can generate lava like punches to attack their opponents with. Description: The user envelops their entire body in a coating of lava that enhances the damage of their physical attacks. Due to the extreme heat generated by the lava, the user is capable of burning the target without coming into direct contact with them. In addition to the offensive damage the armour can inflict, it can also be used for defensive purposes, as it acts as a deterrent towards those who wish to attack the user physically. Description: The user coats himself in lava and punches the opponent. Description: The user expels a large amount of lava from their mouth, which quickly solidifies into multiple boulders of molten rock that are fired towards the target with tremendous force. Due to their composition, the boulders can melt through most objects with ease, and because a considerable number are dispersed over a wide range in quick succession, they are also difficult to avoid. Description: The user creates circles of lava that erupts molten rock on the opponent that enters them. Description: While in his transformed state, the user creates an enormous torrent of lava that violently erupts from the ground, before rushing upwards towards the target. Description: Transforming as Son Gokū, the user spits green flames on the opponent. Description: The user wears this Steam Armour in order to use the steam-based ninjutsu. Along with covering his entire body, the armour contains a furnace in its back, where the steam is produced. The pressure resulting from this emitted steam can then be used to increase the force behind Han's physical attacks. The exact amount of force produced is proportional to the quantity of steam released, as the greater the volume of steam utilised, the larger the pressure that can be built up within the armour is. For example, when a significant amount was used, just a simple kick was capable of knocking both Naruto Uzumaki and Killer B, who only caught the former, a large distance away. Description: Increasing his attack power with his Steam Armour, Han delivers a powerful kick to his opponent. This attack has enough force to generally send his opponent reeling backwards. Description: Kokuō drives its horns directly into the opponent using a powerful charge. The force of this attack was so great that it can send another tailed beast flying a considerable distance away. See http://narutoawakening.freeforums.org/kekkei-genkai-jutsu-list-t64.html 8th post down. Description: Opening its mouth, Saiken releases a dense gas composed of a highly corrosive substance. Because of its gaseous nature, it can cover a wide cross-area in a short amount of time and is strong enough to instantly disintegrate a tree. Description: While in his transformed state, Utakata can ooze an extremely alkaline liquid, which burns upon contact. Killer B while in his full Eight-Tails form commented that the substance was strong enough to burn through his skin. Description: Using Chōmei's wings, the user sends a sharp shock wave at the opponents. Description: While in the transformed state, the user attacks the enemy with a powerful glancing blow, seemingly biting them in the process. Description: Transformed as Chōmei, the user swirls Chōmei's non-wing tail, creating and directing a small tornado towards her opponents. Description: Killer B is able to form ink in his mouth. The ink can be used for a variety of things, such as using his ink covered finger as a makeshift pencil or using the ink to blind an opponent. Killer B used this technique in greater extent when he was able to cover the whole water prison with his ink in order to blind Kisame. The ink can also be moulded into a more solid form to create clones. Description: After assuming his full Eight-Tails transformation, Killer B tightly coils the beast's tails around himself, before extending them with an enormous amount of physical strength. This causes him to spin rapidly, resulting in the generation of tremendous gusts of wind that buffet everything in the surrounding area. This technique was powerful enough to level the terrain within a large range of the Eight-Tails. Description: Kurama has the ability to sense negative emotions such as hatred and killing intent of any individual around it. Kurama has used this ability to find Naruto's inner hatred, which has brought it close to breaking the seal which contains it numerous times before Naruto took control of the fox's chakra himself. When Naruto achieved the Nine-Tails Chakra Mode, he in turn gained this ability, aptly displayed when he uncovered Kisame Hoshigaki hiding within Samehada, even though Kisame and the sword both shared the same chakra signature. According to Tobi, Mito Uzumaki also possessed this ability. Description: The user breathes a powerful stream of fire from their mouth. The flames have enough power to break enormous boulders, and even do damage to Pain's Chibaku Tensei in Kurama's case. Description: The Nine-Tails can fire a powerful beam of chakra, capable of piercing through rock. Description: With a swipe of its claws, Kurama can create a tornado which could possibly do massive damage. The damage was not seen as Pain used Shinra Tensei to nullify it.